Even though it has a larger size and an outer skin with fuzz, the kiwi fruit is really a berry. Chinese khans in ancient days used to consider the kiwi to be an aphrodisiac. Kiwis aren't bothered by very many irritants, so crops don't require much pest control. Kiwi pickers in California wear cotton gloves so they don't bruise the kiwis. 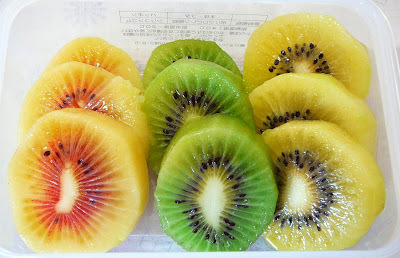 The original name of the kiwi was the Chinese Gooseberry. It was originally grown in China, over seven hundred years ago. Later on, it was introduced to New Zealand, and then California. California kiwi were first grown in about 1960. The average kiwi fruit is about three inches long, and weighs about 2.5 ounces. Nearly ten percent of kiwi grown in California are grown organically. The vines of the kiwi are deciduous. They will remain dormant from November until March, and the foliage falls off, which makes the pruners' job easier. All of the pruning on a kiwi plant is done by hand. New leaves start coming out in March. The canes of the dormant kiwifruit are great for flower arrangements. Kiwis grow like grapes, on shrubs like vines, which are trained to grow on trellises. Their height ranges from five and a half feet to six feet. The vines of the kiwifruit drink in water in the summertime. Each vine drinks about forty one gallons of water a day, in the growing season. Kiwi fruit continue to grow after they are picked. It will ripen as it heads off to the sales markets. The kiwifruit was originally found in Northern China, in the Yangtze River valley. Missionaries took seeds to New Zealand in their travels, at the turn of the century. It became a popular plant there, and several vines were sent to California. Those very vines are still growing in the Chico Plant Introduction Station. Kiwi are also grown for resale in areas like Chile, South Africa and Italy. The kiwi plant needs a relatively long growing season, including at least two hundred and forty days without frost. Therefore, there are many areas in the United States where it is not possible to grow them. When the kiwi vine is in its dormant stage, in the winter, it can withstand temperatures as low as 10 degrees F. But they need to be acclimated to the cold slowly, not hit with it all at once. If a sudden and deep freeze hits, the freezing may cause the vines to split, and the plant will die. Temperatures in the freezing range will kill any kiwi fruit buds that are exposed, so care must be taken to select an area with a mild winter season.